This Rose Gold Nikki Lissoni carrier is perfect for those who love to sparkle! 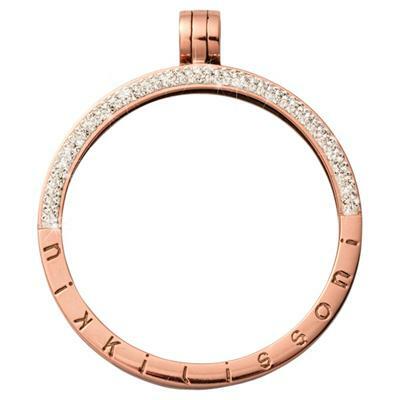 This fabulous design is Rose Gold plated, with the upper circle encrusted in Swarovski Crystals, with the Nikki Lissoni Logo engraved across the lower circle. This large carrier is an easy way to create an evening look with your Nikki collection. This Rose Gold carrier looks fabulous with any of the large coloured Nikki Lissoni coins, whether you decide to collect Gold, Rose Gold, Silver or a combination of coins.